Taking on an intern who’s just good enough doesn’t cut it if you’re looking to add value to your company. But not every student or recent graduate applying for your internship role is going to knock your socks off with his/her skills, experience, and fresh perspective. Let’s face it: Hiring “the right” intern can be challenging; successful recruitment, even at the intern level, can be tough. While your intern candidates may look good on paper, interviews can often be a whole different story. An experienced candidate may arrive and only show interest in a large salary, while others may stumble into your office completely knowledgeable about your company. Building a strong internship program starts with finding talented young interns who can someday transform into full-time hires. 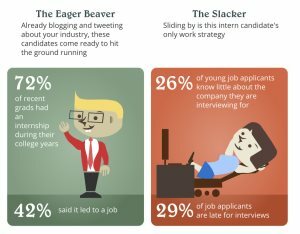 The following infographic compiled by InternMatch, an online platform connecting the best intern candidates and employers, takes a look at some of the best candidates you may come across during your search for a rock star intern. The Eager Beaver: Someone who is already blogging and tweeting about your company. They come prepared to hit the ground running. The Creative Culprit: A candidate who will “wow” employers at every turn with creative approaches. The Chameleon: This person has no problem adjusting to a fast-paced, ever-changing environment. The Cash Cow: Salary is the only thing that matters to this type of person. The Space Cadet: This candidate is a slacker who procrastinates. The Cynic: He or she is the epitome of negativity and dissatisfaction.